W Lindsay & Son is a Cockermouth institution, with a history dating back over 143 years. Originally located on Main Street the shop was founded by William in 1868, and has been family run ever since passing from father to son through five generations. 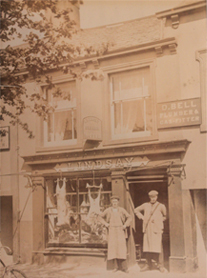 The shop remained on Main Street until the start of the 1990’s when trade had grown to a point where larger premises were required, so in 1992 the shop moved to its current premises on Station Street. While still very much a family business the company has continued to modernize and keep pace with the latest industry practices and standards. William would be astounded to see the changes that have taken place over they years. Gone are the days when the livestock was butchered at the shop; gone is the marble butcher’s block, the meat on display overhanging the pavement and the brass-waited scales used for weighing the produce. Today’s 21st century shops would be a marvel to him, temperature controlled rooms and display cabinets, digital weighing scales and even use by dates. Things have certainly changed over the years, but one thing that remains the same, is the Lindsay family’s commitment to providing locally sourced high quality produce to the people of Cockermouth and the surrounding area. Quality and value are the watchwords of the family, as Richard Lindsay explains “In order to offer top quality meat to our customers we need to buy the best livestock available”. This commitment to quality can be seen by the row of first and champion rosettes on display in the shop window, and the award certificates on display for their renowned Cumberland Sausage, a recipe that has not changed for over a century.